The smallest of the foxes, the fennec fox is identified by its relatively huge ears. It shelters in burrows it digs in the sand and is generally active at night, when it preys on small rodents, birds, insects and lizards. 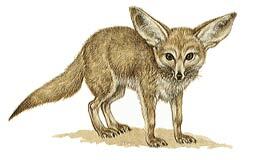 Fennec foxes are sociable animals which mate for life; each pair or family has its own territory. A litter of 2 to 5 young is born in spring after a gestation of 50 to 51 days.